By mid-May most of us are seeing an increased amount of sunshine and have started clearing, cleaning and preparing our decks for a much anticipated season of soaking up the sun and enjoying our outdoor living space. But does your deck love the sun as much as you do, or does the sun’s UV effects on your deck leave you resenting its rays? While our love of the sun is pretty much universal with its mood elevating effects and increased dose of vitamin D, too much of a good thing can do us harm. The earth’s atmosphere blocks approximately 98-99% of the sun’s UV radiation, but that remaining 1-2% can have some undesirable effects. We are well aware of what sun exposure can do to our skin and we go to great efforts to protect it, but the truth is that the sun’s UV radiation will age anything that is exposed to it…and that includes our decks. 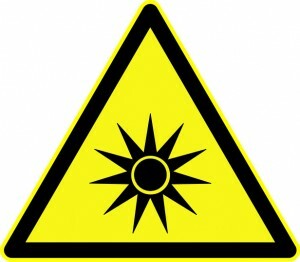 A common issue with any item that experiences permanent or prolonged exposure to the sun is fading or discoloration. We see this all the time with fabrics, paints or plastics on our outdoor items. There is simply no escaping those UV rays. Our decks are no exception. If you’ve placed furniture or other large sun-blocking items on your deck then years later moved those items, the difference in color where the deck has been hidden from the UV rays can be evident. With vinyl deck membranes you have the advantage of long-lasting waterproof protection without the need for maintenance, but it is important to remember that not all vinyl is created equal. To get the most out of your vinyl deck, chose a brand that has a proven performance history and has demonstrated that it stands up to the elements, including UV exposure. Duradek vinyl deck membranes have demonstrated superior performance when compared to other vinyl brands in how well it ages from UV exposure. Certainly, like anything that is permanently outdoors, there will be some color fading over time but when tested against other vinyl brands, Duradek clearly stands out as one of the best vinyl options for maintaining its appearance from UV aging. The images below show the results of Accelerated Weather Testing (ASTM G-90) conducted by Atlas Material Testing Solutions on three different vinyl brands and shows the effects of 840 MJ UV which equates to about 2.5 years of Arizona sun exposure*. (These tests results are from the second round of tests conducted to corroborate the results of the first round of testing and have shown consistent results). Vinyl-TD Results – Clear coat technologies are not yet advanced enough to avoid discoloration from UV exposure. These images show the effects of 840 MJ UV. The vinyl brand above is clearly showing signs of darkening and in the first sample even shows visible cracks in the surface. This particular brand of vinyl uses a clear vinyl coat to protect its surface from scuff marks; however the appearance of scuffs may be preferable to the degree of discoloration from the UV exposure. Vinyl-DR Results – Products available at a much lower price than similar products can often indicate inferior performance. This image is at 840 MJ UV, but this vinyl brand showed failure at only 140 MJ UV. These two samples above are produced off-shore and started failing at 140 MJUV. This vinyl brand is being marketed as a cost-effective alternative for the budget conscious home owner or developer, but clearly the savings are not worth the end result. Duradek Results – Duradek stands up to UV exposure better than many vinyl options. At 840 MJ UV there is very little change in appearance. Duradek is the original vinyl membrane and has been installed on decks in all North American climates for 40 years. From the images above you can see that Duradek can handle the effects of UV exposure much, much better than the competition. There is almost no change in appearance after 840 MJ UV exposure, and even at 1820 MJ UV exposure the effects on the appearance are minimal. 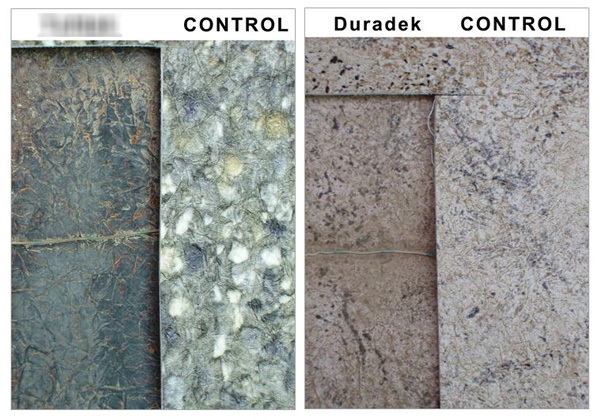 Vinyl-TD and Duradek Results – This image compares the results of accelerated weathering tests at 1820 MJ UV. Duradek show very minimal appearance changes while vinyl-TD has changed drastically. The image above shows vinyl-TD next to Duradek in comparing the effects of 1820 MJ UV next to a control sample. The difference is quite dramatic and a shocking example of why it is so important to choose a product you can rely on. It is certainly worth noting that Duradek offers an appearance warranty while many vinyl brands do not. For a product you can rely on with professional installers who know deck waterproofing, contact a Duradek dealer in your area for a free, no-obligation estimate on your deck renovation.